http://jewishhistoryaustralia.net Click on the flag in top left corner to return to index page of Jewish History Australia. Advertisement - in the form of a facetious Summons by Her August Majesty, commanding potential customers to attend forthwith the habadashery shop of Michael Cashmore. situated at the corner of Collins and Swanston Streets -- on the North-East corner of what came to known as The Block. This add appeared in March 1845, in the Port Phillip Herald, a newspaper otherwise of five dull columns of text. This advertisement, and many others displaying the witty, playful verbal style of Cashmore is from a brilliant article by Trevor Cohen, "Michael Cashmore, A Melbourne Pioneer", AJHSJ vol 6, Part 3, (1967) pp 144-156. Yarra can be seen to the top left, following its original, meandering route. Michael Cashmore, born in 1815 in London, set forth to Sydney in 1836, where he established a drapery business in the "Rocks" district to the West of Circular Quay. This shop in Lower George Street continued until 1840, when he re-established his business in "Port Phillip". His Melbourne shop, on the north-east corner of Elizabeth Street and Collins Street. was in the first four storey brick building erected in the city. The northern end of George Street, Sydney, was very much a centre of Jewish commerce in Sydney, starting in the convict era, throughout the Colonial period, and well into the twentieth century. 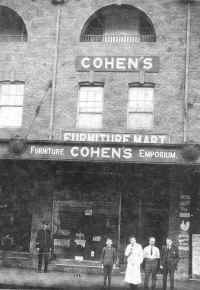 The photograph above, taken circa 1920, is of Cohen's Furniture Emporium, 187 George Street, very close to Circular Quay. At that stage the business was conducted by Herman Cohen, (born Kaganovich), who left his small home town (Rokiskis) in Lithuania circa 1883 to escape the infamous May Laws. The business expanded to cover 185-193, and passed to his eldest son, Bernard (Ben) Cohen, and then onto his grandson Neville Cohen. A few doors further north, from 1933, at 177 George Street was Harmony House, a music store, conducted by Bernard's brother John Cohen. Post WWII, John's son Ron established behind the store a commercial recording studio that is of importance in the history of Australian jazz. Next door (at 175 George Street) was the editorial office of the Jewish newspaper The Hebrew Standard. In the same block was a tailor shop conducted by Mr Dobrinski. The entire block (Essex to Globe Street) was demolished during the redevelopment of the Rocks in about 1973. Cashmore's 1840 shop in "Lower George Street" was located further north , where some early Rocks buildings remain. This web page is a stub. 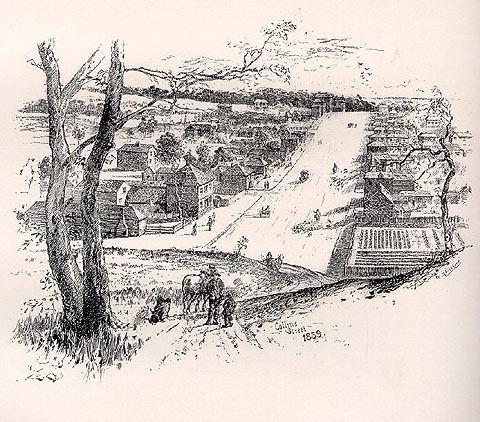 Instances of Jewish pioneering merchants in both NSW and Victoria country towns are scheduled. And did somebody mention Sidney Myer, founder of the leading department store chain?